Torque is delivered to the gear hubs from ZEXEL Torsen® II torque-biasing differentials with inbound-mounted disc brakes. Since the brakes are inbound-mounted, the Hummer's 4-wheel power disc brakes provide exceptional stopping power without leaving the components vulnerable to damage when operating off-road. Power-assisted variable-ratio steering provides for a very responsive steering system. The power steering pump provides hydraulic oil pressure to operate the brake system. The Hummer features a four-wheel, long travel double-A-arm coil spring suspension with large-diameter hydraulic shock absorbers inside the coils for added protection in harsh environments. The front suspension incorporates a large stabilizer bar for better handling and reducing sway in turns. Together with the wheel and tire assembly, the Hummer's suspension system provides a comfortable ride on even the roughest terrain. Goodyear MT/R Radials 37 x 12.50R/17 with One-Piece Aluminum Wheels, Central Tire Inflation System and Runflat. High: When operating in high range, the internal differential allows the front and rear tires to rotate independently for smooth cornering on hard surfaces. High lock and low lock: The locked positions lock out the internal differential, transmitting torque equally to the front and rear axles. High lock is used primarily on slippery surfaces such as snow-covered roads or muddy trails, when extra traction is needed. Low lock provides an added gear reduction for increased torque. It is used under the most severe terrain conditions, when both traction and maximum torque are required. General Motors 4L80-E 4-speed automatic with maximum torque rating of 430 ft/lb. This is widely regarded as the best and most durable four-speed transmission ever designed. The automatic transmission not only makes the Hummer easy to drive, but it also allows smooth transition of power for improved off-road mobility. Over time, it monitors your driving technique and adjusts to your driving style. NOTE: Must specify FE9 Federal Emissions. 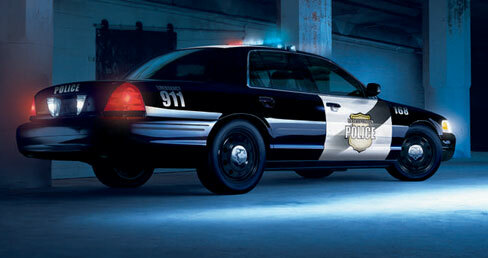 Copyright © 2004-2011 www.PoliceCars.us All rights reserved.